Coverage: Live on BBC Radio Scotland & online. Live text on BBC Sport website. Glenn Whelan is a surprise late addition to the Republic of Ireland squad for Friday's Euro 2016 qualifier against Scotland at Celtic Park. Whelan was expected to miss the game after suffering a leg fracture in the draw against Germany last month. However, the Stoke player joined the Republic squad on Monday night and took part in training on Tuesday. 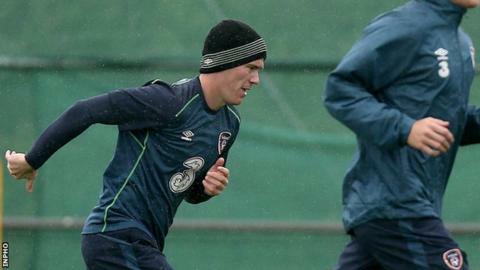 James McCarthy remains a concern because of a hamstring injury while Kevin Doyle is out of the squad. Doyle has returned to his club Crystal Palace because of a groin injury which reduces the squad to 27. Whelan will follow a specific rehabilitation programme over the coming days before a decision is made on his availability for Friday's game. Stoke manager Mark Hughes said last month that he expected Whelan to miss the international contest but the midfielder was allowed to travel to Dublin after taking part in a training session at his club on Monday. McCarthy complained of a tight hamstring after Everton's draw with Sunderland on Sunday but has been allowed to link up with Martin O'Neill's squad. Whelan's Stoke team-mate Marc Wilson has been ruled out of the Republic squad by a hamstring problem. Ipswich Town striker David McGoldrick and Derby full-back Cyrus Christie have both received their first Republic call-ups for Friday's qualifier. Neither is expected to feature at Celtic Park but they could make their debuts in Tuesday's friendly against the United States. McGoldrick and Christie qualify through having Irish grandparents. Nottingham-born McGoldrick, who was adopted, discovered his Irish heritage after researching his ancestors. McGoldrick, 26, has formed an attacking partnership at Ipswich with another Republic striker Daryl Murphy while full-back Christie, 22, has impressed during his 18 appearances for Derby this season.